Telluride Resort Reservations, the official central reservations for Telluride and Mountain Village, offer dozens of lodging options, from ski-in, ski-out hotels like the Peaks Resort and Spa and the Inn at Lost Creek to private condos and homes. To get the best service, selection and rates, make sure you research and book your lodging early. Once you are here, you can park your car and forget about it until it’s time to leave. 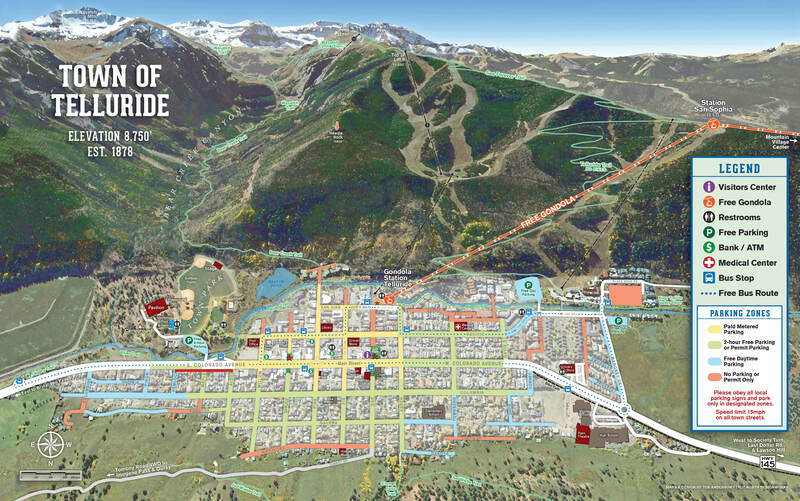 With dial-a-ride, Mountain Village shuttles, the Telluride Gondola and pedestrian-friendly layouts of both Telluride and Mountain Village, feel free to forget your keys. No matter where you go during your visit to Telluride, the views are jaw dropping. Take in beautiful mountain vistas, rugged peaks and some of the best sunsets your eyes will ever see. Getting back and forth between the town of Telluride and Mountain Village is easy, with Telluride's free Gondola, the first and only free public transportation of its kind in North America. Between the two towns is San Sophia Station, where you can get off the gondola to visit the Resort’s flagship restaurant, Allred’s. Kick-off your first day on the mountain with a complimentary mountain tour from one of our Mountain Ambassadors. Learn about the history of the mountain and get acquainted with its various areas of terrain. Mountain Tours depart daily at 10am from the top of the Coonskin Lift (Lift 7). Lace up your skates and take a spin under twinkling lights around the Mountain Village ice rink next to the Madeline Hotel and Residences. Skates are available for rent, or you can bring your own. If you are planning on skiing two days or more, buy your lift tickets at least 48 hours in advance at a lower price than you would see at the window. All winter long Telluride comes alive with live music and events, from our Club RED concert series to rail jams and more. Visit our events calendar to see what might be happening when you are in town. Allred’s, located at San Sophia Station at the top of the Gondola, offers sweeping views of the San Sophia Range and the historic town of Telluride below. During the day, visit some of our on-mountain restaurants including Alpino Vino and Bon Vivant for a fine-dining experience with spectacular scenery. Telluride is an experience meant to be shared. Bring your loved ones and make this a vacation to remember.